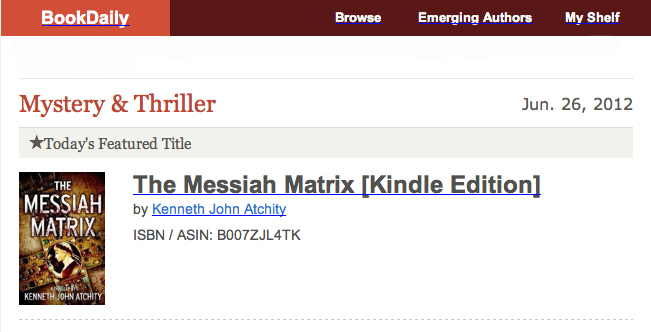 The Messiah Matrix book trailer has now exceeded 10,000 views on YouTube! Was This Anti-Nazi Pope Murdered? When people think of the Vatican and World War II, they think immediately of Pius XII, the controversial pontiff between 1939 and 1958. But before him, there was a little-remembered pope, Pope Pius XI, who was loudly outspoken against the Nazis and was determined to call the world's attention to their atrocities. "The Pope's Last Crusade" tells that story, along with that of the pope's partnership with an American Jesuit, which breaks new ground about war-time conspiracies within the Vatican. The pope rejected being present while the "crooked cross of neo-paganism" flew over Rome. Hitler's anti-Semitic campaign had become the pope's great preoccupation. Many scholars think that Pius XI's crusade against Hitler, which took place in the last months of his life, could have changed course of events, possibly even the severity of later atrocities against the Jews. But Pius saw Hitler as an insane presence in the world and had been searching for a means of applying pressure and rallying international leaders against Nazism. It would not be easy. He was 82 years old and increasingly ill. At the same time, powerful cardinals and bishops around him feared the pope's activism against Hitler. In particular, the Vatican secretary of state, Cardinal Eugenio Pacelli, counseled caution in challenging Hitler and Mussolini. Pacelli eventually would eventually succeed Pius XI. Sworn to silence, LaFarge took up the papal assignment clandestinely in Paris. The pope's directive, however, had thrown LaFarge into the hazy realm of Vatican politics. The leader of the Jesuit order worldwide, Wlodimir Ledochowski, promised the pope and LaFarge that he would facilitate production of the encyclical. Privately, Ledochowski, an anti-Semite, conspired to block LaFarge at every turn. In late September 1938, after about three months of work, LaFarge traveled to Rome with his papal mission complete. His superior, Ledochowski, welcomed him and promised to deliver the encyclical right away to the pope. He dismissed LaFarge and directed him to return home to the United States. Ledochowski did take care of the speech -- by burying it for months in Vatican bureaucracy. The pontiff, unaware of these machinations, was stepping up his criticism of the Hitler, and Mussolini. He criticized Mussolini's imitation of systematic attacks on Jews in Germany and Austria. As in Germany, Jews in Italy were banned from attending school, from holding public positions or serving as doctors, lawyers and in other professional functions. Pius XI condemned these actions. "Spiritually," the pope said, "we are all Semites." The pope, finally with LaFarge's text, planned immediately to issue the encyclical after a meeting with bishops on Feb. 11, in which he would condemn fascism. He worked on that speech on his own, jotting down ideas, rewriting and editing it by hand. Rumors, meanwhile, had reached Mussolini that the pope might be planning to excommunicate him or even Hitler, also a Catholic, a blow that could actually damage their popular power base. Bishops in some quarters grumbled about the circumstances of his death and questioned the kind of stimulants he had been given in an attempt to revive him. Cardinal Eugene Tisserant of France, the pope's best friend and a former French intelligence officer, wrote in his diary that the pope had been murdered. Pacelli, the secretary of state, became Pius XII, and the Vatican immediately toned down its vocal protests against Hitler and Mussolini. One historian, Conor Cruise O'Brien, the noted Irish writer and politician, in 1989 said that those months in 1938 were crucial as Hitler measured how the world would react to his campaign against the Jews. "Had Pius XI been able to deliver the encyclical he planned, the green light would have changed to red. The Catholic Church in Germany would have been obliged to speak out against the persecution of the Jews. Many Protestants, inside and outside Germany, would have likely to follow its example." How effective Pius XI's efforts might have been can never be known. It was only clear that he took a stance in favor of absolute morality and defended to his last breath his principles of decency and humanity, nothing more, nothing less. 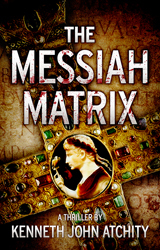 The eLit Awards have honored The Messiah Matrix for excellence in e-literature. 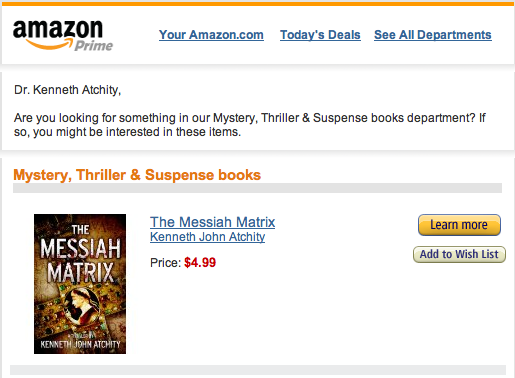 Amazon selects The Messiah Matrix for their Prime members including to Dr Kenneth John Atchity! Dr. Kenneth John Atchity has created a novel that is not only an absorbing story, but it is also a platform for re-thinking the beginnings of Christianity as we have been taught. This fact will doubtless unsettle many right wing religious conservatives - much the way that Darwin's concept of Evolution has always caused them problems. And if that is an afterburn of reading this novel then we should hope it gains a very wide readership. Atchity is a scholar, highly regarded among academics, and it is this aspect of his novel THE MESSIAH MATRIX that gives him the edge. The ideas he poses are scientifically grounded and so well developed, based on archeological findings and research, that the themes of this book cannot be disregarded. Add to that the fact that Atchity writes with an elegant style, not only in a manner that makes his story propelled forward at all times but also he creates a compelling atmosphere - both above and below the waters of the sea! As with all successful novels there are power struggles, love stories, adventures around every turn and to reveal more would diminish the impact of the slowly unraveling mysteries that connect to question the validity of the historical Christian Savior. It is the mixture of investigative acumen and the gift for relating mystery writing in a style so eloquent that it resembles the major books of literature that makes this book so solid. There are those who compare it to the Da Vinci Code genre of books and yes, it is every bit as intoxicating as those. The difference is in the writing style. Kenneth John Atchity could write about any topic and he would be worth of reading, so beautiful is his mastery of the English language! "The wicked witch is not quite dead, but the present pope has resigned.."
Ken Atchity discusses The Messiah Matrix with host, Yi Tian on ActorsE chat. A dreamer who realizes his dreams and helps others do the same, Ken Atchity has impressive credits in the worlds of film, television and publishing. His long list of academic achievements and awards include a Fulbright Professorship of American Literature at the University of Bologna, the Faculty Achievement Award at Occidental College, grants from the National Endowment for the Humanities, Mellon Awards, and he was consultant on classical drama for the Mark Taper Forum. He's published over a dozen books, everything from academic studies of Homeric literature to essential self help for writers. He edited the Classical Roman Reader and Classical Greek Reader for Oxford University Press. A connection between Christ and Augustus Ceasar? The wise men following a star in 17 BC? Curiouser and curiouser! Although you know what they say about curiosity. The Monsignor searching for the ashes of Christ -- which he was killed before explaining. Does the Holy See condone murder? Damn Skippy it does! This book is amazing! The two main characters of Ryan and Emily are the perfect pair of detectives. Will they be more? You'll have to read the book! Emily's coin is vital to the history of Christianity in the world, but will they get it back? On the coin, Augustus was wearing a crown with twelve spikes. What's up with that? 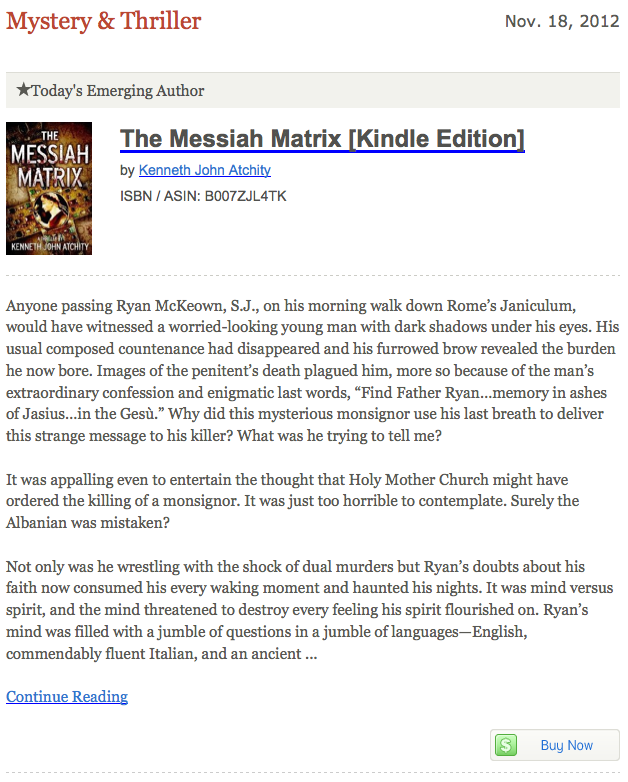 For anyone who loves thrillers, romance, and a story that may forever challenge the way you look at religion, The Messiah Matrix is highly recommended. 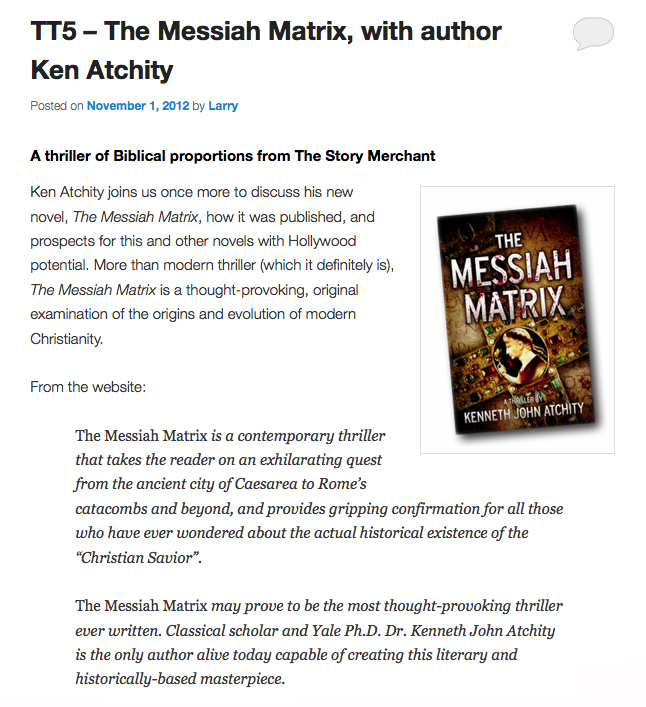 I recently had the pleasure of interviewing my literary manager, Emmy-nominated film producer and writer Kenneth Atchity about his new thriller, "The Messiah Matrix," and the many misconceptions aspiring novelists have about the business of writing. YOU'VE AUTHORED SEVERAL BOOKS OVER THE YEARS, BUT ALL NONFICTION WITH THE EXCEPTION OF FINISHING THE LATE WILLIAM DIEHL'S (AUTHOR OF PRIMAL FEAR) TITLE, SEVEN WAYS TO DIE. WHAT MOTIVATED YOU TO WRITE FICTION? KA: I've always worked with fiction, analyzing it as a professor and academic, and editing and publishing it in my second career as a literary manager and now publisher. I just hadn't found a story that captured my imagination until this one did. 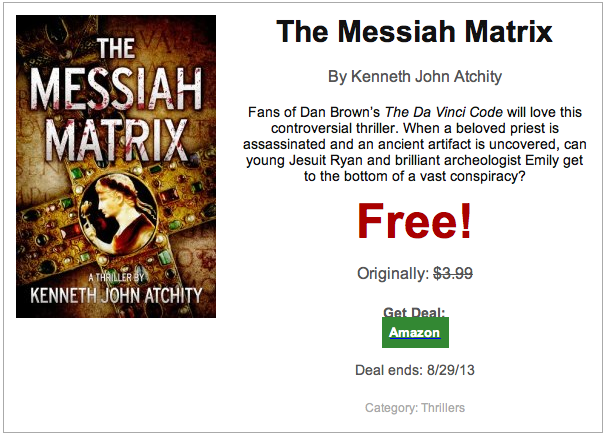 THE MESSIAH MATRIX IS SELLING VERY WELL AND GETTING AMAZING REVIEWS. TELL US ABOUT THE STORY. KA: It's a story targeting all those who've wondered whether the "facts" we were told about Jesus, growing up Catholic and Christian, were all really true. And why there are so many contradictions in the New Testament. And why there is no historical evidence that Jesus ever existed as an actual man walking the earth. I believed all that until I was about sixteen, and started putting two and two together and getting five. WHAT WOULD YOU SAY IS THE "BEST" AND "WORST" ASPECTS OF BEING A WRITER? KA: The best aspect is the intensity of having absolute control over the world you're building and the characters who live in it. The worst is the interface between writing and publishing. But the worst has now been massively mitigated by the Internet age and e-publishing that allows writers to get their stories direct to their audience, for better or for worse. KA: Like everyone else, I punt. I let all my friends and contacts know about them. I blog about them. 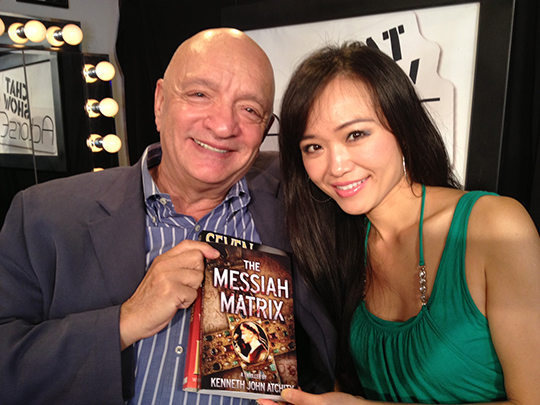 I have Facebook pages–visit Messiah Matrix's page or its website, www.messiahmatrix.com. I made a book trailer and got it posted on every book blog that would take it as well as on YouTube. I don't let a day go by without thinking of another way to market it. If you believe in a story, you move heaven and earth to get people to read it. If Shakespeare and Euripides and Sophocles and the Brontes had to do that why shouldn't I? KA: Endless revising is the biggest challenge. I'm still revising, and the book is published. I will do a new edition someday with little tweaks in it. KA: That's a great question. I think my most effective tool has been reaching out to my "database" and asking them to spread the word about my book, but I do that with the trailer embedded in the reach out. WHAT ADVANTAGES DO YOU ENJOY AS AN INDIE AUTHOR THAT YOU WOULDN'T HAVE WITH A TRADITIONAL PUBLISHING HOUSE? KA: Ownership is the greatest advantage. I'm not giving up my publishing rights in perpetuity, which I'd be doing if a traditional publisher published the book. I made a joint venture with a small British publisher that allowed them basically to distribute it, while allowing me to share 50/50 in all rights with them. So we are already pursuing film interest. KA: I don't have writing days. I write every single day, and make sure I get in at least an hour a day–on a stopwatch that clocks ONLY writing time. When I'm not writing, I stop the watch, as described in my book, "A Writer's Time." As Hesiod said long ago, "If you put a little upon a little, soon it will become a lot." KA: I honestly have never experienced it in my life, except before the age of seven when I wasn't writing. I'm too busy to be blocked. If I get "stuck" for a moment, I turn off the day's stopwatch and move to something else until I get unstuck. KA: My only long-term goal is to continue writing. This year I've published my completion of William Diehl's (the late author of Primal Fear) Seven Ways to Die, my nonfiction book Quit Your Day Job and Live Out Your Dreams, and now The Messiah Matrix. I'm now completing the screenplay for "Seven Ways to Die," and have two other nonfiction books to get to. I can't imagine running out of ideas of what to write next, though I'm determined not to start a new novel until I find a story as compelling as the one behind The Messiah Matrix. KA: Sheer love for storytelling and for the act of formal communication. I believe communication is the hope for the human race, and that we are approaching that Omega Point predicted by Jesuit philosopher Pierre Teilhard de Chardin where all humans are in full communication all the time. KA: Misconceptions held by aspiring novelists are as numerous as aspiring novelists. And we all have to go through them: belief that they know what they're doing as novelists, belief that they don't need editorial help, belief that the world will beat a path to their door, belief that they deserve fame and fortune, belief that they can bully others–as someone who's represented authors for twenty-five years I could go on and on. The aspiring authors who are happy to be writing, thrilled to be represented, delighted to be published and humble about constantly improving their art make it all worthwhile–though they are few and far between. I'm happy to say I've represented some of them for nearly twenty years at this point. And now, through Story Merchant Books, I'm privileged to be publishing them as well. See www.storymerchant.com. ANY WORDS YOU'D LIKE TO LEAVE FOR ASPIRING NOVELISTS? KA: Never give up, never give up, never give up. Hone your craft. Be eager and grateful for constructive criticism. Be appreciative to anyone who's in the marketplace who will actually help you. Throw all preconceptions about the world of publishing out the window, because the world has done just that in the last five years. Think outside the box. Don't confuse your creativity with your marketing. Build an iron curtain between them in your brain, and spend as much time marketing as you do writing. You must proselytize your own work! You must take responsibility for it, from the very beginning–if you have a dream, and don't make it come true, the world may lose something unique forever. If you construct the dream, you MUST let us know about it no matter how long it takes you and what it costs you. If you're not going to invest in your own career, how can you expect anyone else to? The great thing about today's publishing situation is that if you're an unknown writer, or even a 'somewhat known' one, and get accepted by a traditional publisher you will HAVE TO promote your book or no one will see it. If you publish yourself, or through my company for example, you will still HAVE TO promote it, but the difference is that you'll get nearly five times more of the revenues and you will not lose control of the rights. So it's not hard to figure out what to do, is it? I have so many I'm about to publish a book of quotations for writers that I've collected all my life. But I love this one: "On the day of victory no one is tired." KA: Thank you for this opportunity! 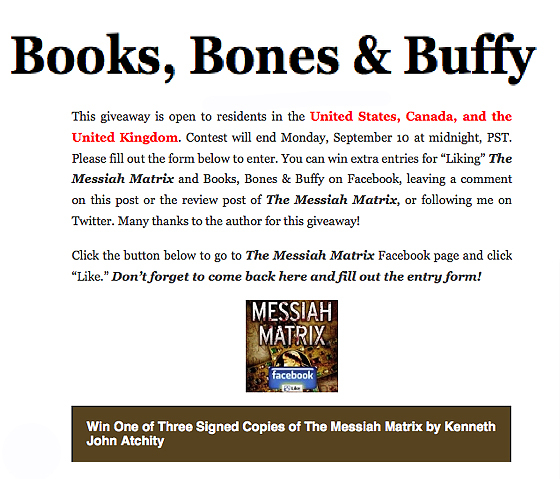 The Messiah Matrix free to enter competition! Win one of three signed copies. As one of the leading sites for sharing videos, Dailymotion attracts over 110 million unique monthly visitors and 1.8 billion videos views worldwide (source: ComScore, April 2012). Their mission is to provide the best possible entertainment experience for users and the best marketing opportunities for advertisers, while respecting content protection. Have you ever wondered if Jesus Christ actually walked the earth? Dr. Kenneth John Atchity, Ph.D. began pondering this question years before he became a Classical scholar and Hollywood producer. Half a century later he presents an unequivocal answer to the question: "Yes, but not the Jesus Christ that we learned about in church." This controversial conclusion, reached after years of research stretching back to his Jesuit high school days, is that a Christian savior did indeed walk the earth but was intentionally created by Rome's myth-making machine under the direction of Augustus Caesar. He recently published this controversial idea, but not in the form we might expect. Even though Atchity is a former Roman scholar—his Classical Roman Reader was published by Oxford University Press—he realized that disseminating the highly-charged evidence was not going to be an easy task. He's authored a half dozen scholarly books, including Yale's Porter Prize-winning Homer's Iliad: The Shield of Memory. This time, instead of a non-fiction book he wrote a novel. "The sad fact is that the work of most unbiased scholars writing on the history of Christianity gather dust on book store shelves," Atchity comments, and adds, "If they even get into stores in the first place. Very few people read them. I wanted to create something that could potentially reach millions of people, something that would entertain as well as educate, and encourage readers to explore questions and mysteries about the origins of the Christian faith that haunted me from my adolescence. 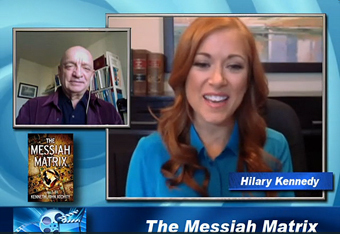 My hope is that those who read The Messiah Matrix will become curious enough to embark on their own search for truth." In Atchity's debut novel a newly-ordained, doubt-ridden Jesuit priest embarks on a journey to discover the truth, based on actual historical evidence, exploring the contradictions in the New Testament that even Biblical scholars have failed to explain. The novel, published jointly by Imprimatur Britannia and Story Merchant Books, reveals an aspect of history that has remained hidden for millennia, repressed by the "literalists." Dr. Atchity won an Ignatian Scholarship to Georgetown, where he was awarded the silver medal from its venerable Virgilian Academy. He was later honored by a Woodrow Wilson fellowship to Yale, followed by a Fulbright professorship to the University of Bologna. His professorship in classics and comparative literature at Occidental College, Los Angeles makes him eminently qualified to write The Messiah Matrix. Dr. Kenneth John Atchity, now a writer and film producer, is available for interviews: kja@aeionline.com. A printed or electronic version of The Messiah Matrix is yours upon request by writing to the same email. Although I knew from the book blurb more or less what The Messiah Matrix was about, I wasn't quite prepared for the unique combination of carefully researched material and breathless adventure story. The subject matter of The Messiah Matrix is controversial, even for someone like me who has no religious leanings, and I expect it will cause a stir in the religious community, and with those of the Catholic faith in particular. Although filled with exhaustively researched details about how the story of Christ came to be, I was surprised by what an exciting and page-turning read this was. Atchity does a great job of interspersing the historical facts with nail-biting action sequences that propel the story along. The author imparts much of his researched information through flashbacks to the days of Caesar Augustus, the first emperor of Rome. These chapters not only immerse the reader in the rich history of Rome but give great insight into the main premise of The Messiah Matrix. I was riveted by the tales of religious iconic imagery, like the cross and Jesus' crown of thorns, and the actual origins of these images (at least according to Atchity). The author also includes a table of events at the back of the book that gives the reader an easy-to-understand comparison between his researched facts and the events of Jesus' life highlighted in the Bible. Many thanks to Mr. Atchity for supplying a review copy. 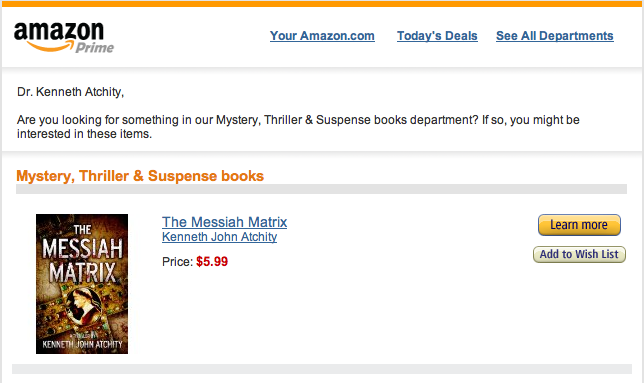 Book reviewer extraordinaire, Tammy, has The Messiah Matrix in her sights. 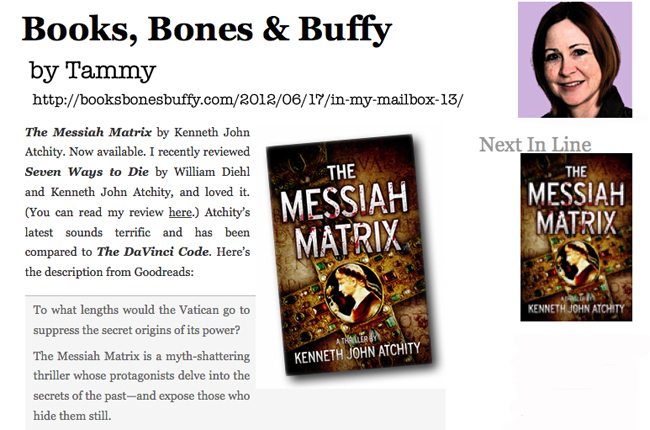 Tammy is next to read and review The Messiah Matrix following how much she loved Kenneth John Atchity's Seven Ways To Die novel. Grolier Club Book Festival names Kenneth John Atchity's Seven Ways to Die for Grand Prize. A crime thriller with a unique back story is the grand prize winner of the 2012 Beach Book Festival, which honors the summer's hottest reads. Seven Ways to Die is the final book from best-selling author William Diehl, who passed away five years ago after writing 400 pages of the novel, yet leaving it incomplete. His wife allowed his friend and fellow author, Kenneth John Atchity, to step in and complete the work. Atchity, who has written 15 books and produced 30 films, used notes and an outline to finish the 'whodunit.' Fans of The Messiah Matrix will not be disappointed. The judges awarded the book top honors for its colorful characters and intriguing plot, making it a perfect beach read for the coming season. Dr Atchity will be honored at a private awards ceremony to be held on June 22, 2012 at the Grolier Club in Manhattan. 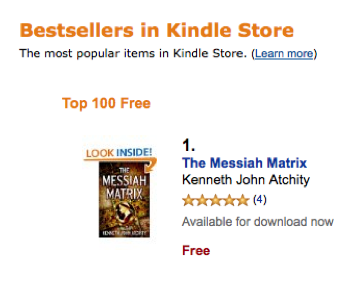 The UK Amazon Kindle store saw unprecedented buying for The Messiah Matrix resulting in it shooting straight to number 1 in the free sales category within the first four days of it going on sale. 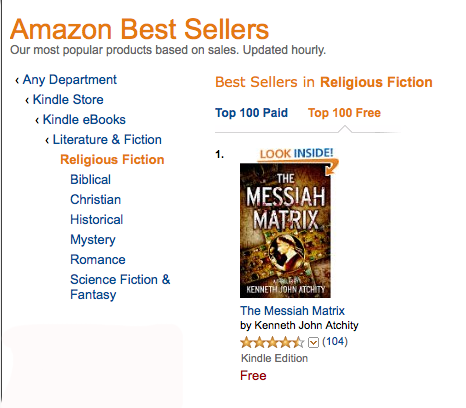 In the USA The Messiah Matrix shot straight to the top of the Amazon Kindle store section for Historical Mysteries.